Updating System Drivers makes your computer run better. It prevents device errors and can even lend quicker repairs to future problems. SlimDrivers and DriverUpdate allow you to remove and update obsolete driver versions to prevent conflicts and maximize computer stability. Optimizing your PC. Having a slimmed down update process makes it easier to get the latest drivers, including those that improve computer performance, PC function and user accessibility. Better Controls. 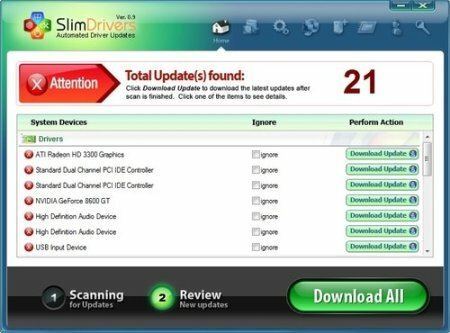 With SlimDrivers and DriverUpdate, you can take control of the various drivers on your PC. Quick setup lets you find outdated drivers, update old drivers and restore broken drivers just by pointing and clicking.